There’s been a few bands called Fuzz already, but no one deserves to inherit the name more than Ty Segall. Segall has already made a name for himself as the most prominent man in garage rock, never fearing to turn the volume and the distortion past the max. And with this debut of yet another side project, he’s matched his output from 2012. This, his solo “Sleeper” and an album with Mikal Cronin called “Reverse Shark Attack” are his 2013 contributions. His work isn’t consistently great, but it’s usually pretty reliable. “Fuzz” isn’t as good as Ty Segall Band’s relentless 2012 album “Slaughterhouse,” but that’s easily in my top 10 favorite albums. Here’s the thing though – this isn’t a Ty Segall project. This is a band, one that wants to be seen as one. Ty Segall’s name shows up nowhere on the cover or in the band name. He doesn’t even play guitar – he’s on drums (and still on vocals). Fuzz is easily the most comprehensive-feeling project he’s done. Even “Slaughterhouse” showed how much Segall was in control. This is where “Fuzz” excels the most. It feels like a proper band. A very loud one. The album starts with a feedback drone on “Earthen Gate” before starting the song on a crawling pace. The pace doesn’t last, but it helps to separate this from Segall’s other heavy works. “Fuzz” has the intensity, volume and distortion of “Slaughterhouse,” but purposely leaves out the speed. The tempos are largely pretty fast, but the songs take time to develop instead of blowing through at brutal, rapid paces. And there’s some experimentation, too. The album’s midpoint has two of the three longest songs – “Hazemaze” stops periodically and resets itself, and “Loose Sutures” has a lengthy period of near silence before Segall gets a drum solo. The closer, “One,” (the longest track) sets a blisteringly fast pace behind a punk beat and lets the band mess around on an instrumental finale. The album has a feel of very early metal, back when it was kids in garages playing fast and loud while avoiding the simplicity of punk. 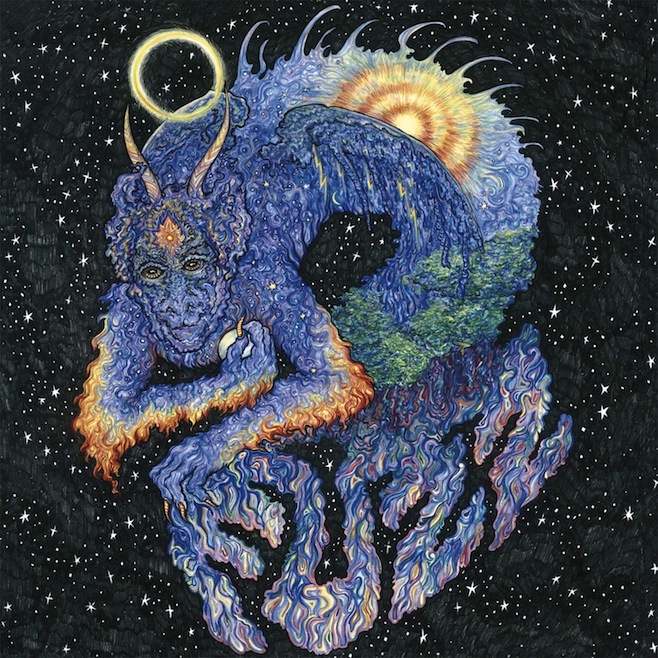 “Fuzz” has a powerful, thrash element to it, thanks mainly to Charles Moothart’s pillars of guitar. Some simple riffs and solos turn a garage rock album into a classic rock-resembling one. But the album does feel a little repetitive at points. The volume you’d expect from a Segall project is there – “Preacher” is among the most assaulting songs he’s been involved with. But occasionally it rests just on the volume factor, which is nothing close to shocking for fans. And having the album’s longest track have such a long period of near-silence is pretty disappointing, as listeners might expect a soloing adventure. Luckily, it ends before it starts to get too gimmicky, and it ends on such a strong and fun track. We may never hear from Fuzz again, or they could release another album by March. But their debut is more than decent, with the loud and crunchy guitars we love, some great drum work, Segall’s strong voice (and a great vocal sub from Moothart), and that nostalgia factor. It’s not the best album Segall’s had his name on, but it does stand as one of the better ones. If you like this, try: I’ll get out of Ty Segall because there’s so many garage-punk bands I love right now: Metz, Parquet Courts, Thee Oh Sees, FIDLAR, Pangea and the unforgettable Jay Reatard all have A++ albums to check out.